Many roads in the Houston area, such as highway 288, have been deeply flooded by Hurricane Harvey. Photos of water-covered neighborhoods and families riding floating refrigerators to safety have made clear the scale of Hurricane Harvey’s wrath. But the risks that coastal Texans faced before the storm hit — and the probability that others will be dealt a similar fate — are still a confusing mess. Surveys have shown that even people who live across the street from the bureaucratically determined risk zones known as floodplains don’t understand how those boundaries were drawn or what the risk metric that defines them really means. Stories that emphasize this fact are “doing the Lord’s work,” said Wesley Highfield, professor of marine sciences at Texas A&M University at Galveston. But there are still more holy offices to perform. The concept of using a “100-year flood” as a benchmark for risk isn’t just misunderstood; it obscures fundamental statistical problems in how we assess flood risks — problems that can lead to residents and homeowners believing themselves to live in a zone of safety that isn’t there. It may be time for us to find a different way of evaluating that risk altogether. Floodwaters covered this neighborhood near Interstate 10 in Houston on Thursday. 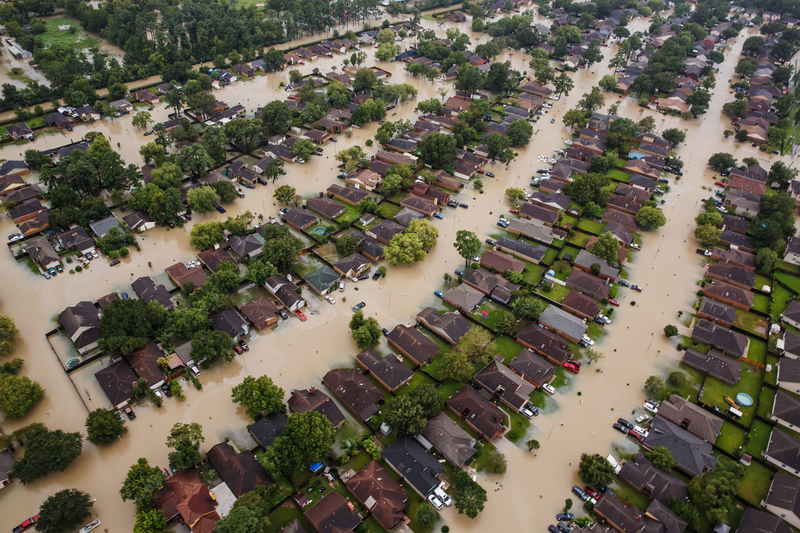 The term “100-year flood,” which Harvey has almost certainly caused,2 entered the American vocabulary in 1973, when the federal government first defined which parts of the country would fall under new flood control regulations and which would not. If a parcel of land fell inside the boundaries of where a 1-percent-annual-risk flood was likely to reach, any new buildings constructed there would have to be elevated and insured — and would therefore be more expensive. And you might not be able to build there at all. Outside the floodplain, there would be no restrictions. But there’s a gap between the data those maps are built on and the floodplain boundaries themselves. To get from point A to point B, scientists have to make a lot of assumptions and extrapolations, building in layers of uncertainty that mean the final determination of what is and isn’t in the floodplain should never be thought of as exact. 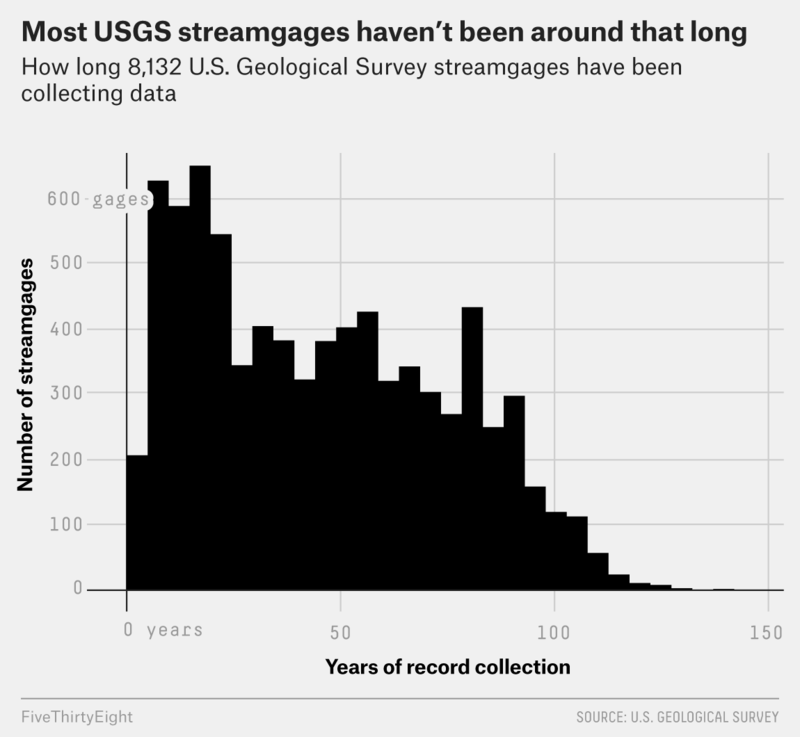 It begins with roughly 8,000 streamgages, sensors that the U.S. Geological Survey has deployed to collect real-time data on the depth and velocity of rivers and streams across the country. Throw that into a mathematical potpourri with other data points — what’s known about the shape of the stream, say — and you can come up with an estimate of flow, water measured in cubic feet per second. The USGS collects these flow estimates, plotting them over the years to find the normal amount of water that moves down a given stream — and what that flow looks like when it jumps to levels well above average. Finally, a computer model helps turn those high flow rates (a measure that doesn’t tell you much about whether your couch will be underwater) into an estimated flood depth (which does). Plunk the flood depth estimates down on top of maps and you get a floodplain. 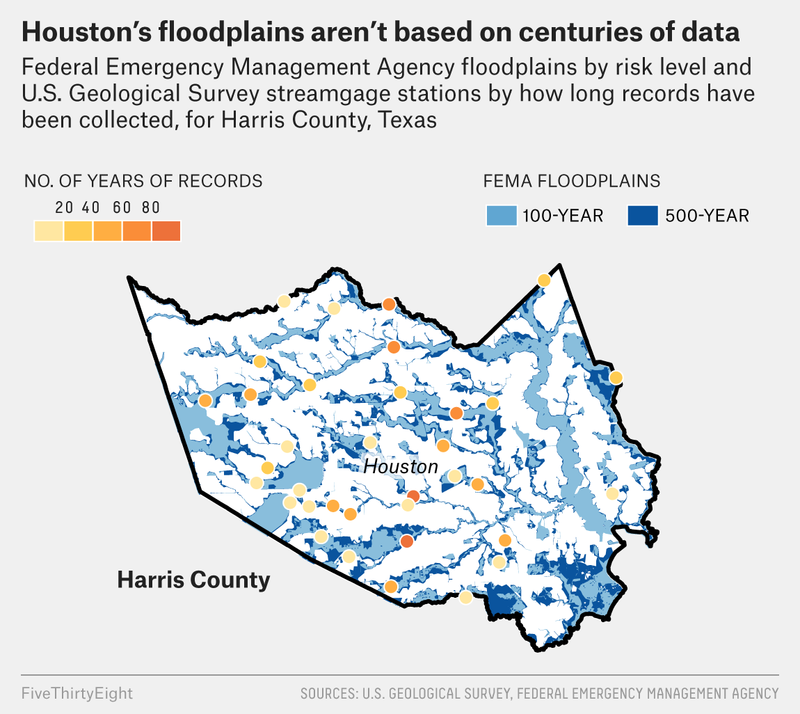 These floodplain maps are best understood as estimates — and not necessarily very reliable ones. “Something like 15 to 20 percent of insured flood claims happen outside the floodplain,” Highfield said. In the Houston area, he found that number to be closer to 30 to 40 percent. “Doesn’t seem like it’s performing well,” he said. There are three big problems happening with this metric, experts told me. First, there’s the streamgage data. Although there are lots of these tools, they aren’t everywhere there’s a flood risk, and some of them haven’t been collecting data for very long. In the Houston area, for instance, some of the streamgage data goes back less than 50 years. And we don’t know how representative those years were of the region’s full history. The fewer the data points, the more uncertainty gets baked into the risk metrics, and the less reliable the floodplain predictions will be, said Robert Holmes, national flood hazard coordinator with USGS. Then there’s the fact that the models we use don’t account for the fact that cities aren’t static. Because Harvey is a hurricane and the flooding is happening on the coast, there’s been a lot of discussion about what these floods mean in the context of global climate change. But the bigger factor in flood map uncertainty could be how humans have changed the landscape and what we’ve built there, said Laura Read, associate scientist at the National Center for Atmospheric Research. The flood risk map for the Houston area was updated in late 2016. But the previous map was a decade old, and local emergency management plans were still based on it when Harvey hit. And because maps aren’t updated annually, even newer maps might not reflect changes to urban development — hills that have been flattened, soil that’s been paved over, wetlands filled in. Things change fast in suburban and exurban America, and places that absorbed water four years ago might not do that as well today. That affects what ends up underwater and when. The risks are constantly changing, but the estimates of the risks aren’t. Finally, because of all the uncertainty, a flood that has a 1 percent annual risk of happening has a high water mark that is best described as a range, not a single maximum point. Experts might say that 10 feet of water represents a 100-year flood, but there’s a margin of error that means an actual flood on that scale could be significantly shallower — or deeper. Holmes said he has dealt with lots of elected officials over the years who thought of the depth of a 100-year flood as an exact point. “But then I show them the uncertainty boundaries, and they see the 2 or 3 feet on either side, and all of a sudden their eyes become opened,” he said. Decisions about zoning and flood mitigation would be more informed if they were based on the range of possible flood heights. All of this means that floodplain maps, and the regulations and insurance rates that come from them, are being handicapped by the metric they’re built on. But Highfield and other experts are still grappling with the question of how to change it. The truth is there’s no perfect way to measure the risk of flooding — there’s always going to be some kind of gap of extrapolation between observed data and predicted risk. For instance, an Obama-era rule enacted after Hurricane Sandy (and since eliminated by President Trump) would have asked agencies to adhere to one of a trio of stiffer flood risk standards, one of which would be building to the level of a rarer 500-year flood — one that has a 0.2 percent chance of happening each year. In general, experts said, designing laws and buildings around a 500-year floodplain means fewer people will be harmed and less property damaged even during smaller floods. But it wouldn’t make maps more accurate. A 500-year floodplain still wouldn’t have taken the ongoing change of landscapes into account. Likewise, a 500-year floodplain would still be based on the same, limited, historical data points. And using the same data to estimate the risk of an even rarer event would have created a larger range of possible high-water marks than the already wide spectrum that comes along with the 100-year flood metric. At left, President Trump receives a briefing on Hurricane Harvey this week. At right, advisers brief then-President Barack Obama on Hurricane Sandy in 2012. Instead, Highfield would like flood risk regulations to be based on less of a “yes/no” dualistic metric — is this inside the floodplain or not? — and more on a spectrum of possibility. That’s not a totally crazy concept. For instance, there’s no single price for car insurance for everybody. Instead, it’s based on a spectrum of risk — younger people and sports car owners pay a little more than grandmas who drive station wagons. A spectrum of risk would make the already complicated job of risk communication more confusing, he said, but the actual decision-making process about development and land use might be better served. Decisions still have to be made, even when the data we’re basing them on is imperfect. But whether we could or should change the metric is different from whether we will. And Highfield, who has been studying the metric’s usefulness and accuracy since 2011, doesn’t think that’s likely. Both he and Holmes said a change would require Americans to think differently about the way we balance safety with other concerns, such as the cost of constructing flood protection infrastructure or the freedom to build in places we maybe shouldn’t. This number is derived using probability theory. First, we calculate the probability of there not being a flood over a 30-year period. Since for each year, there is a 99 percent chance of there not being a flood, the chance that there is no flood over 30 years is 74 percent (or .99^30). The probability of a house in a 100-year floodplain being inundated at least once, then, is just the complement, so 26 percent. The U.S. Geological Survey has not yet determined the scale of the flooding, but the storm now holds the record for greatest amount of rain dropped by a single storm in the continental U.S. ever. And in some places, the waters have exceeded the benchmarks for a 500-year flood — a flood with only a 0.2 percent chance of happening in a given year.